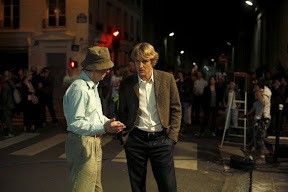 As an American in Paris with delusions of nostalgic grandeur, Owen Wilson goes out walking after midnight, out in the moonlight, finding the Lost Generation instead of his hotel room in writer/director Woody Allen’s latest cinematic soufflé. Long tired of cranking out movie scripts opposed to literary manuscripts as a self-professed “Hollywood hack,” when a car straight out of the Jazz Age roars Gil (Wilson) back into the ‘20s he’s been obsessed with since he was in his twenties, the aspiring novelist goes toe-to-toe and tête-à-tête with the artistic expatriates he idolizes most in Midnight in Paris. From partying with F. Scott and Zelda Fitzgerald (Tom Hiddleston and Alison Pill) to taking literary pointers from Gertrude Stein (Kathy Bates), Gil relishes in the "moveable feast” with the man who wrote the words – Ernest Hemingway (Corey Stoll). Torn between the seductive pull of the era he’s always idealized and the life he leads in the twenty-first century, Gil spends his days wandering through museums and tourist traps with his uptight, practical minded fiancée Inez (Rachel McAdams) and his nights becoming increasingly attracted to Picasso’s beguiling muse, Adriana (Marion Cotillard). But despite the fact that he needs a tour guide (Carla Bruni) for French interpretation, Gil learns you don’t have to speak the Romance Language to understand that the reason Paris is for lovers is because true l’amour never gets lost in translation. And in the case of Woody Allen’s contemporary American couple who do far more talking than communicating in both languages of English and love, it takes a pre-honeymoon trip to Paris for Gil and Inez to realize that even in the City of Lights, the mismatched pair can’t elicit a single spark of sexually charged electricity. Preferring to spend their time in the romance capital of the world apart rather than together, after Inez bumps into her handsome former professor (Michael Sheen), she gets in touch with her forgotten twenty-something dreams as well, dancing in the moonlight with her old crush while Gil goes walking after midnight with Adriana. However, instead of truly developing two equally strong plotlines for both of his Americans in Paris, Inez is pushed by the wayside. Thus, unlike most fascinating Woody Allen heroines, McAdams’ thoroughly unlikable character is painted as a one-dimensional shrew from start to finish in favor of devoting as much screen time as possible to Allen’s ingenious time-travel element, for better or worse. And given my own romantic weakness for the Lost Generation, it's easy to give into the whismy undertaken by Allen in Paris, which fuses together the supernatural sentimentality of his bittersweet fantastical love story Purple Rose of Cairo with the same spirit of romantic abandon enjoyed by Americans abroad in the Woodman's motion-picture postcard Vicky Cristina Barcelona. Yet just like a photo-snapping tourist who hopes to capture it all or a kid in a candy store who longs to try every flavor, as a filmmaker who’s so inspired by the period that he wants to bring every one of his artistic heroes to life, Allen understandably begins to sink into the quicksand of repetition while taking the gimmick too far. Flawed yet frothy and undeniably fun, Paris is bursting with potential. 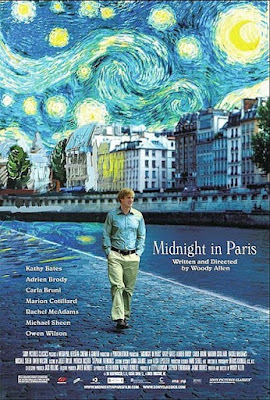 And as is always the case with Woody Allen from the dropped novel plot from You Will Meet a Tall Dark Stranger to Gil’s present-day discovery of Adriana’s ‘20s diary in Midnight in Paris that begged to be explored in a major arc rather than as a mere set-up for stagey-slapschtick, brilliance is found in the details. To quote Pulp Fiction this time instead of Patsy Cline, Midnight in Paris is perhaps best appreciated as “a wax museum with a pulse” that features terrific in-character walk-ons from Stoll’s pitch-perfect Hemingway to Adrien Brody’s tongue-in-cheek turn as Salvador Dali. Instead of developing a truly worthwhile plot for Gil, Midnight becomes a lot like one of the tourist diversions that Wilson’s character visits during the day as a gorgeous, charming, affable but slightly forgettable distraction. And in his first movie shot entirely in France, the auteur synonymous with New York city takes off his trademark spectacles to take in Midnight in Paris la vie en rose, resulting in a cinematic parade-like ode to his favorite time and place.